Some people are looking for a spirit to slap them around a little and make their heart skip a beat. Others are looking for a somewhat more refined and sophisticated experience. It is those people who will most appreciate a slow dance with luxorious THE JEWEL OF RUSSIA CLASSIC VODKA. The spirit is skillfully crafted in a traditional Russian style, from a blend of premium rye, hardy winter wheat and artesian spring water. The fermented mash is distilled in continous stills, then repeatedly filtered through high absortion screens. The Jewel of Russia Classic Vodka is appropriately named. It has a pristine clarity, a satiny texture and a rounded, medium-weight body. Even at room temperature the vodka barely generates any heat on the palate, then makes its presence known by completely filling the mouth with crisp, spicy flavors. The finish is warm and lingering. 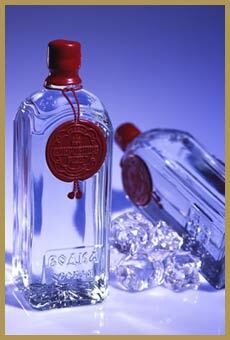 As magnificent as The Jewel of Russia Classic Vodka is, the distillery has done it one better. Presented in a beautiful bottle, THE JEWEL OF RUSSIA ULTRA VODKA is imbued with a slightly more flavorful palate and subjected to a more strenous filtration regimen. Minor differences aside, both The Jewel of Russia Vodkas are classy, museum-quality spirits.